My friend Andrea Ewen, of EwenStyle, presented me with this award this morning and I was so surprised! I had been visiting her blog (and I HIGHLY recommend you visit, too; she's got amazing talent) and just happened to see my name on yesterday's post. Other people had presented Andrea with this same award, and it is the sort of thing that gets passed on. 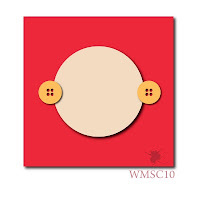 Thank my friend Andrea, without whom I certainly would not be blogging today. 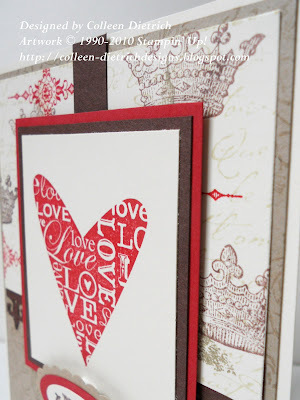 We met through Splitcoaststampers and began 'chatting' with each other about blogs. 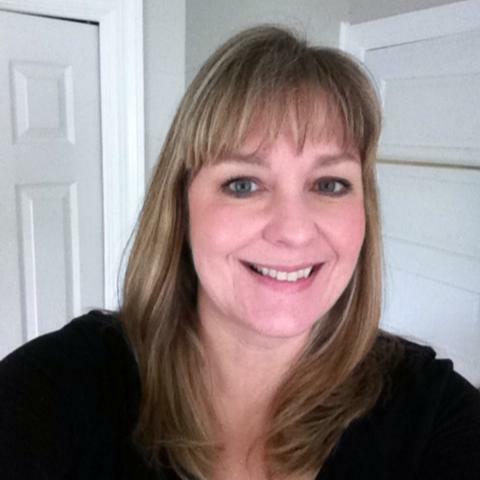 She gave me the ultimate push to get started on my blog in early June this year. 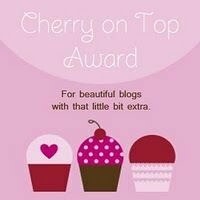 Post the Cherry Award, which I am most proud to do! I feel I am doing a good job parenting my two beautiful daughters. My organizational skills. 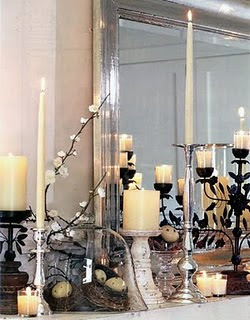 I organize anything and everything; it's a hobby! Post a picture I love. These are my girls when they were 7 and 3 years old. 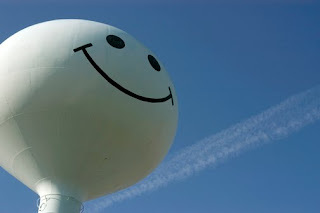 We had just gotten a digital camera and this is among the first photos taken with it. In the background are juice boxes and a booster-seat tray, symbols of youth. The girls have grown so much since then, but looking back at the earlier pix make me all sentimental! Someone hand me a tissue. 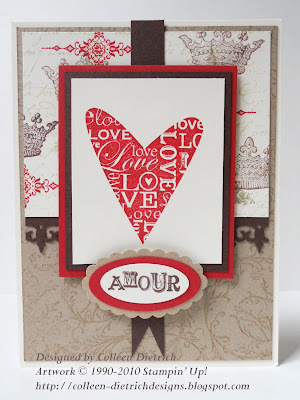 Leslie Miller - Running with Scissors - for her soft, lovely creations that speak to my heart, many of which are made with Flourishes stamps - one of my fave stamp companies. I can't name Andrea Ewen, since she was the one who passed this award on to me, but if I could I would! Thanks again, Andrea, from the bottom of my heart. See you all when I get back from Disney! 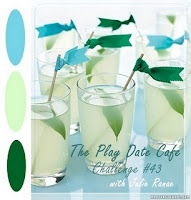 I just found out that my 'Cool Blue Get Well' card won recognition over at the Play Date Cafe! Yippee! They have a cute way of rating their picks for the week, like FAB4, Cup of the Week, and Cream In Our Coffee (they even have a Private Blend Designer). I'm drinking my regular cup of coffee as I write this. Godiva Chocolate Truffle is what's brewing here today. And this new "Creamer" from Play Date Cafe sure tastes good with it! I'll be back making cards after my trip to Disney World. Have to hit Target tonight for those awesome little travel-size items, and cat food so my kitty doesn't starve. My kids love to dress him up. This is an American Girl cap he's sporting here. He sure is patient! We think he kind of likes it. Thanks for letting me share my news. I'm a happy girl! 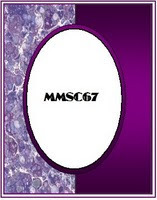 Thanks to my friend Pam, a former Guest Designer over at MMSC and "pam124" over at Splitcoaststampers, for telling me about my win. So glad you said something, Pamzi! I had actually already visited MMSC today to check out the new sketch challenge and completely did not see the winners' names listed right below the new sketches. Silly me! This was my first time playing at MMSC. 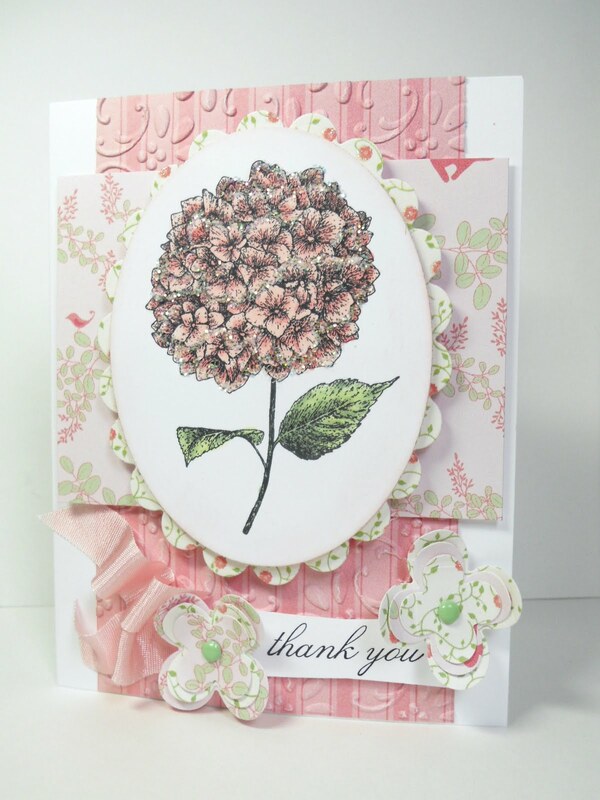 Thank you, Priscilla and the rest of the team, for choosing my card! 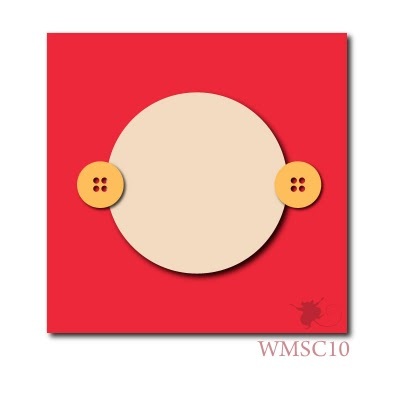 Remember that song from Sesame Street in the 1970s, "One of These Things"? It was always a highlight for me when I'd watch the show. 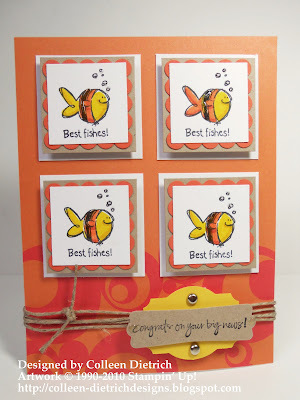 It occurred to me when I made this card last night (with already-stamped-and-colored images from my 'baggie') that I included one fish that does not look like the others. See the different fellow on the top right? His tail fin is orange, whereas everyone else has a yellow one. It wasn't intentional, but hey, it's good to be different, right? and played at Let's Ink It Up, where you are supposed to use yellow somewhere on your card. The designer paper is courtesy of my 8 year old daughter, Kerry. It is a sheet from her fashion designing kit. She wanted me to have it. Isn't that sweet? 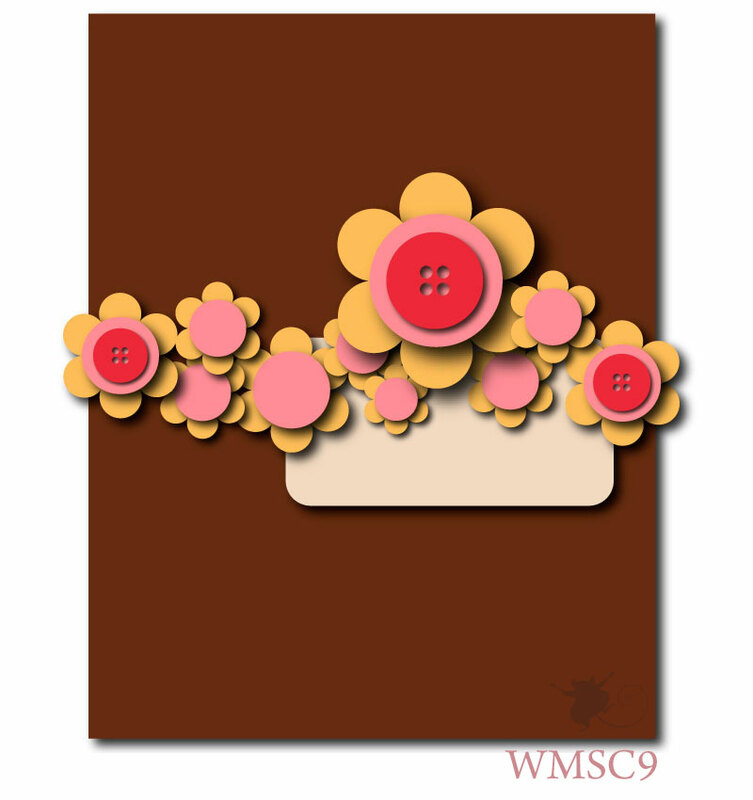 So Kerry, this card is dedicated to you, Punkin! 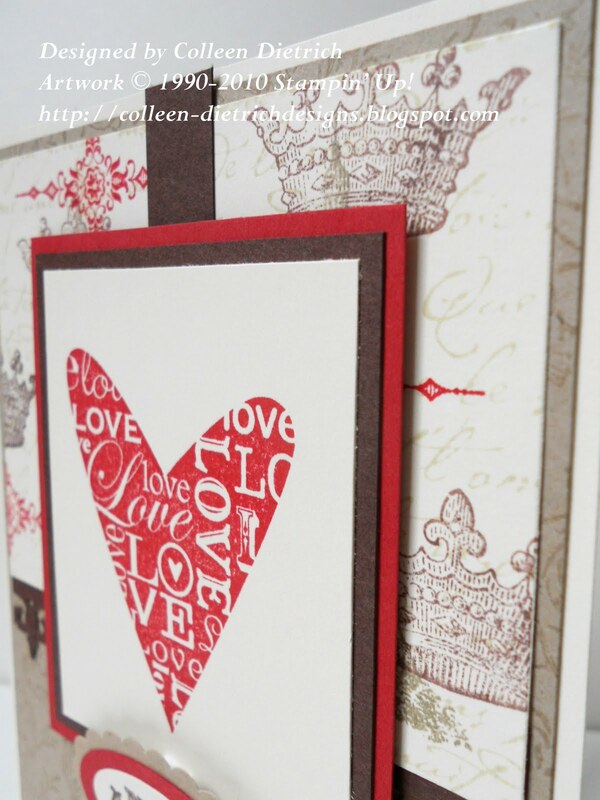 I hope to stamp another card soon, but forgive me if I don't have another post this week. I am packing for Disney World! There is much to do before we leave. 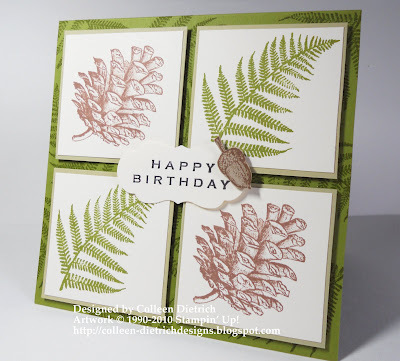 These two stamps, the fern and pinecone, are loose stamps that have been sitting in my Single Stamp Box for much too long. I like them a bunch, but you know how it goes: so many stamps, so little time. 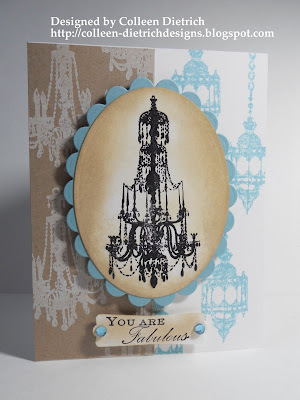 Recently my friend Benzi featured a card similar to this one on her blog. 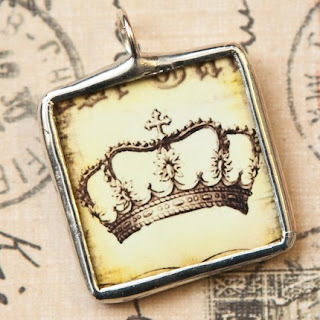 I believe it's even the same pinecone stamp. 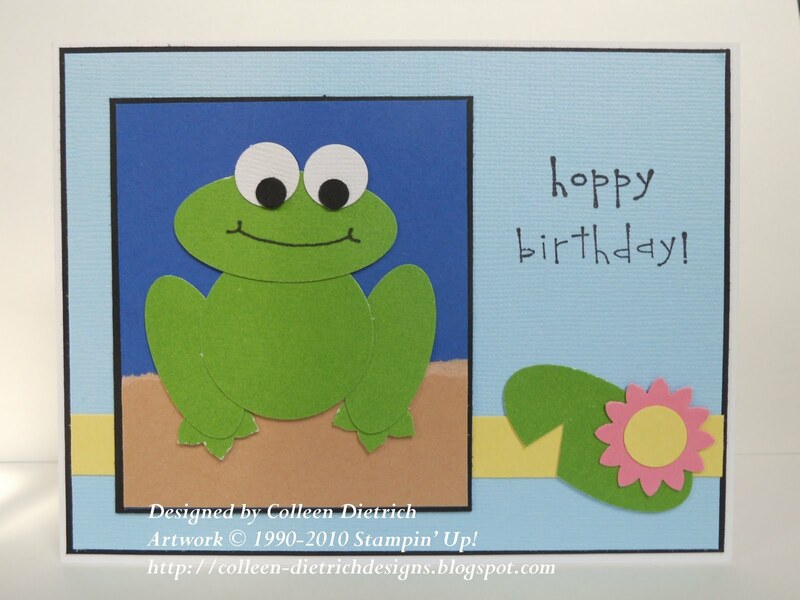 Benzi, thanks for the inspiration for this masculine woodland birthday card. What a relief it is to finally ink up some new stamps! I got these when my mom visited in early July and they have just sat patiently in their box waiting to be played with. Now that I think about it, this card isn't as 'clean and simple' as they come, is it? I was really focusing on the colors and not the fact that it was supposed to be CAS. Oh well. It's sorta CAS, so I'll stick with it! I need more Get Well cards in my stash, so I made 6 of these today. 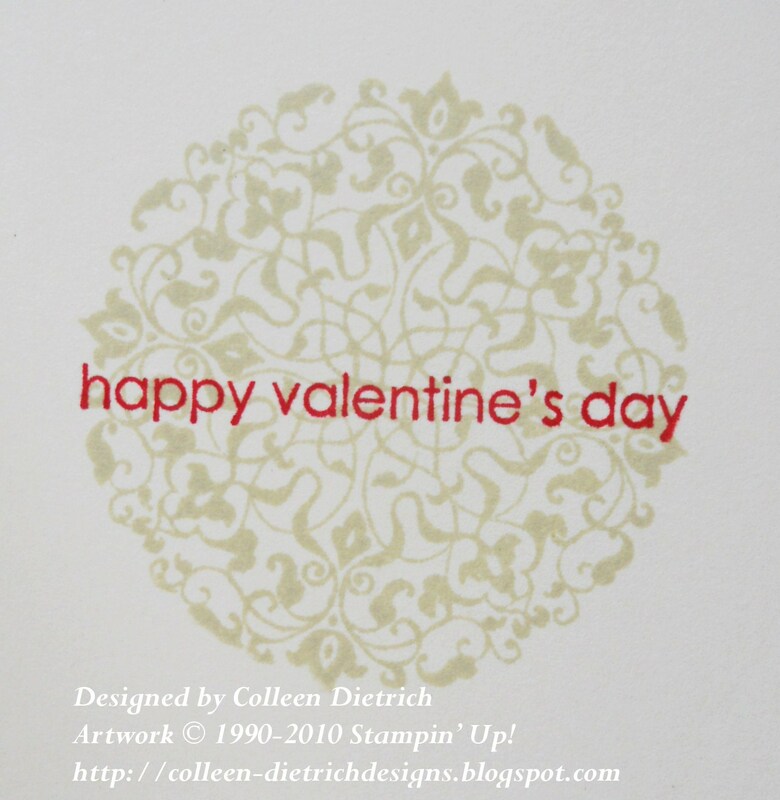 The originally-planned stamp was a little bandage with a face on it, from the Stampin' Up! set called Wellness Wishes. The bandage is more 'cutesy' and it really wanted to be used, but after this card was assembled, cutesy just didn't seem right. 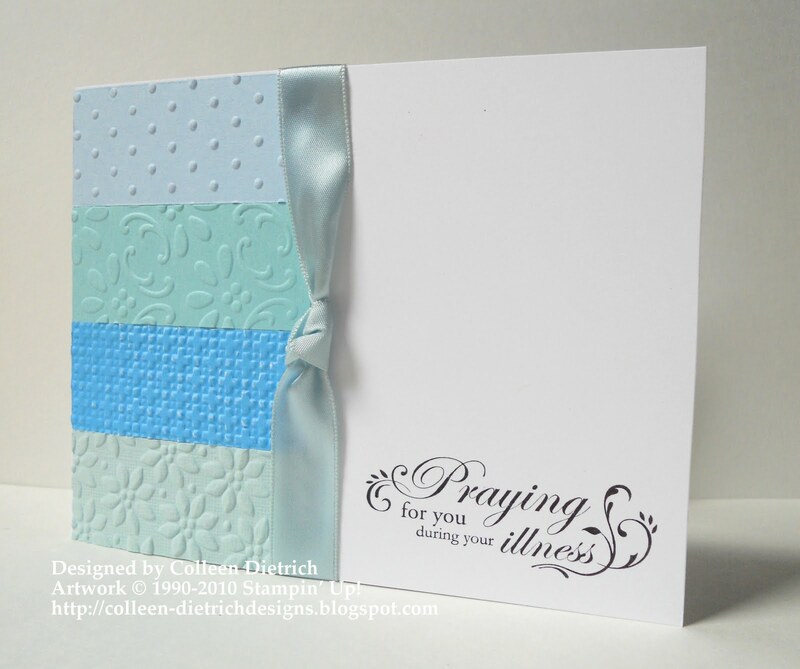 Thankfully, this set offers different styles for a get well message. 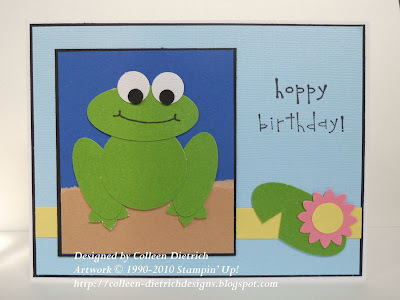 Remember my sympathy card here? 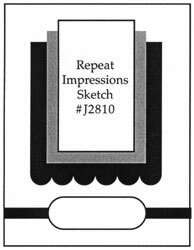 I relied upon that sketch layout once again because it is easy. 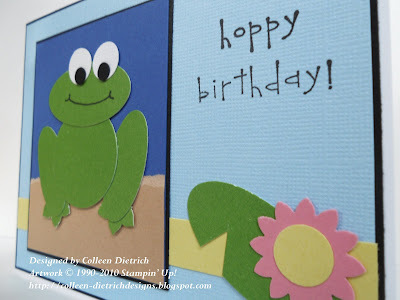 But instead of using one large piece of embossed cardstock on the left of the card, I divided it up into four equal sections of differently-embossed pieces. We might get some rain here today in New Jersey. We need it pretty badly. Aside from Stampin' Up!, my favorite stamp company is Flourishes LLC. 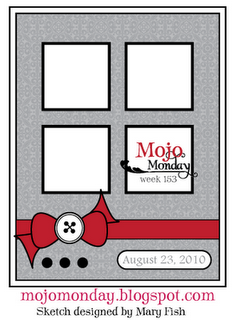 The stamps are gorgeous, the design team is fabulous, and the whole company image has such panache, if you ask me. I am quite pleased with the card; hope you like it too! 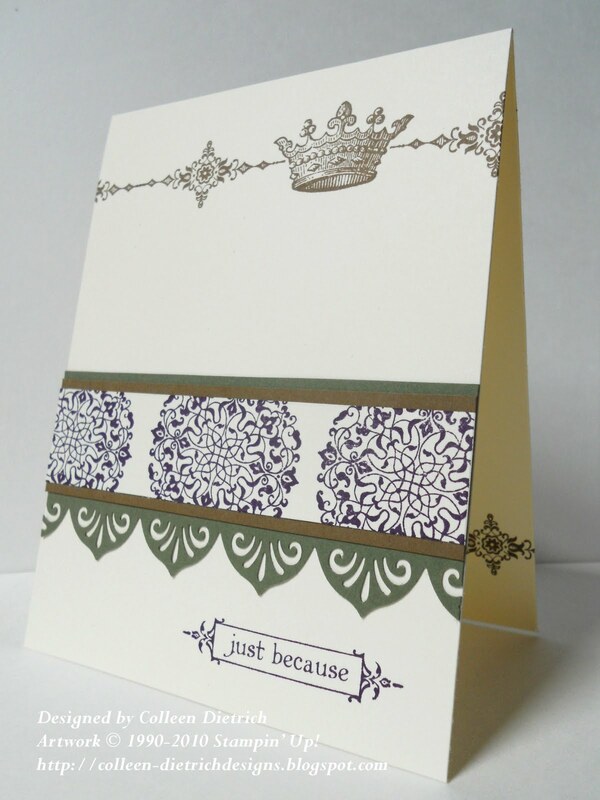 The sentiment "Just Because" is from SU's new Notably Ornate set, and the medallion, crown and other decoration is from Artistic Etchings, also from the new catalog. I am totally happy with these two sets! Thanks for peeking at my card. For a change, it was quick to make! 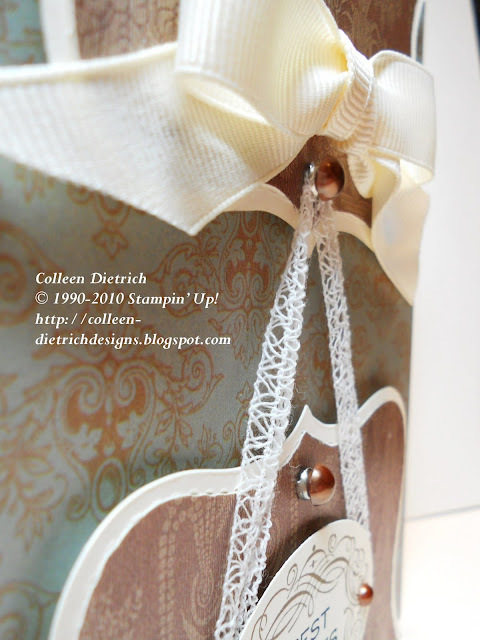 A couple of years ago, before I even heard of Stampin' Up! (can you imagine there was a time?? ), my friend made a card for my daughter. I thought it was the cutest thing ever, and saved it. Last night, I approximately CASE'd it, subbing one punch that I don't own and switching up the color just a bit. For versions that would be given to boys, I used white and yellow for the lily pad flower instead of pink. Hope you enjoy this little critter! He's easy to make in quantity. 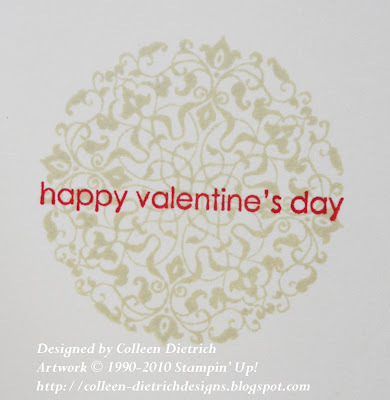 Yesterday, the goodies I had ordered from Stampin' Up! arrived. We all know that feeling - new toys to play with! 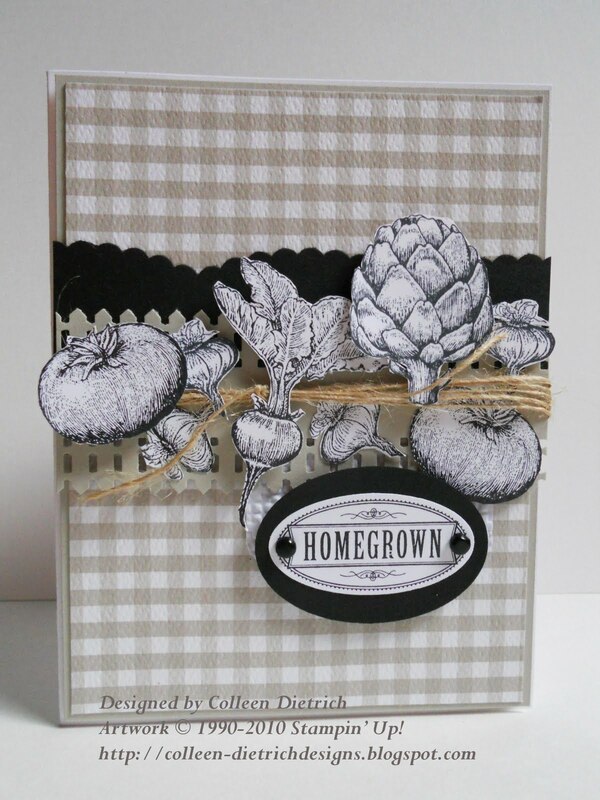 This fun stamp set called Homegrown is awesome. I love it. 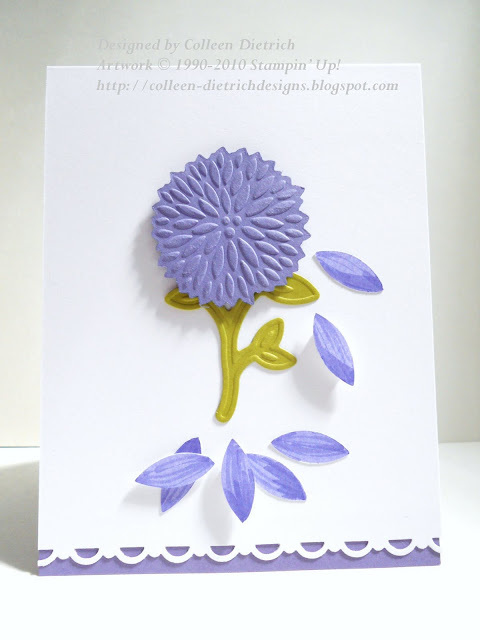 Because of the oval sentiment and shapes of the tomatoes and the artichoke, I was also able to play at Alphabet Challenge Blog's "O is for Ovals". Can't wait to play with more of my new stamps! Oh, was I excited when the idea for this card came into focus! So many things all just fell into place at once. See the petals that have been plucked off? Do you remember my stamping bargains? Some of the goodies I occasionally pick up from my Stampin' Up! 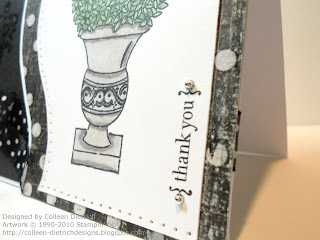 demonstrator are $1.00 Bags full of the most wonderful scraps ever. 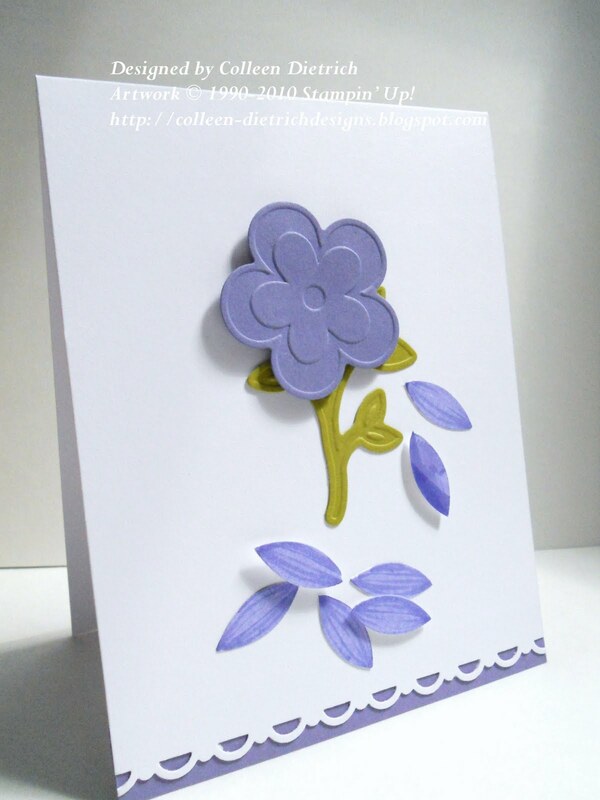 The die-cut flowers and stems you see on these cards were in those bags, just begging to be used. 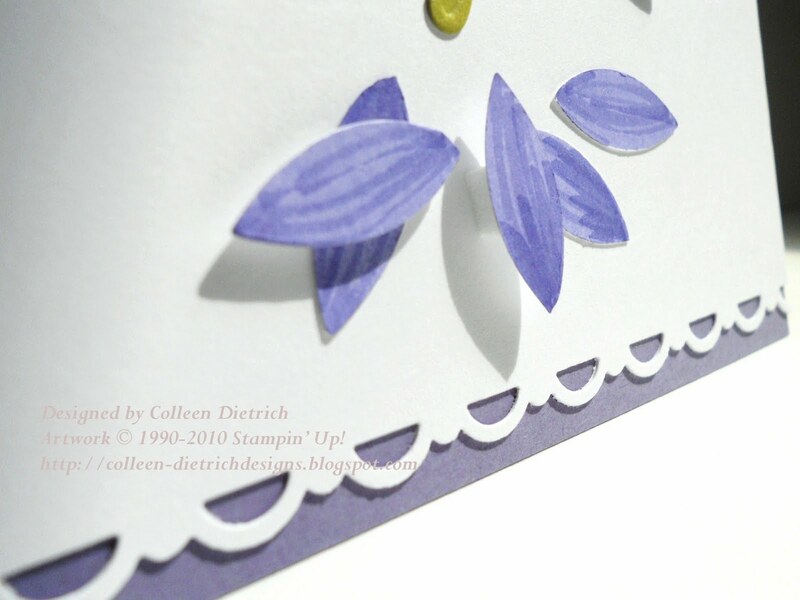 The petals that have been 'plucked' off are little cast-offs from using a Bigz Lattice die from SU. These little ovals fall out of the lattice once you run it through the Big Shot. (I'm telling you, I save almost EVERYTHING!) I simply ran a Lovely Lilac SU marker over each one carefully to give the petals a natural appearance, shading some of them a bit. Hope you enjoyed my latest creation! Yesterday my husband, the girls and I took a day trip to the Jersey Shore. We like to go to Longport. It is not too far from Atlantic City, but it is so different. As we travel through the small towns to get to Longport, it is like traveling through a game of Monopoly. We see Marvin Gardens (it is a real, and really pretty, neighborhood), pass by Pennsylvania Avenue, the Boardwalk, and go through the town of Ventnor. If that doesn't say "Welcome" I don't know what does! It felt good to take a day trip (and find two pieces of sea glass - yay! 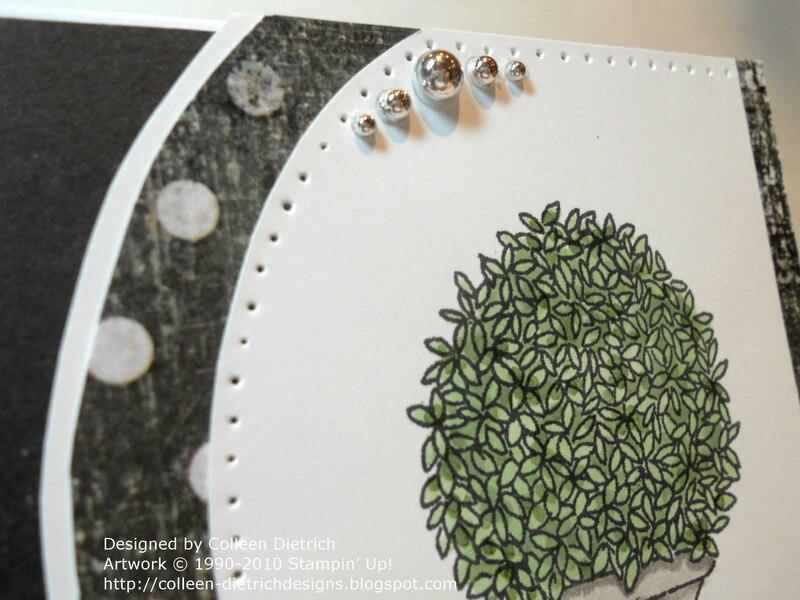 ), but I'm glad to be back home stamping again. Hope you're enjoying your summer, too! I had this card on hand in my stash, in the "Sympathy" category. 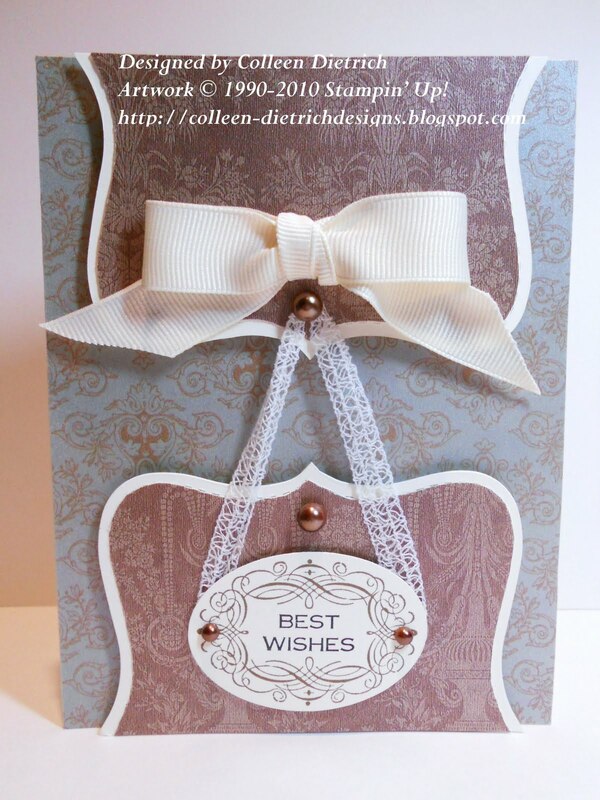 It sat for a long time unused, which was just fine, because no one ever wants to find need for a sympathy card. The father of a super-nice, super-sweet co-worker of mine passed away recently. This card went out today to Brandon and his family. 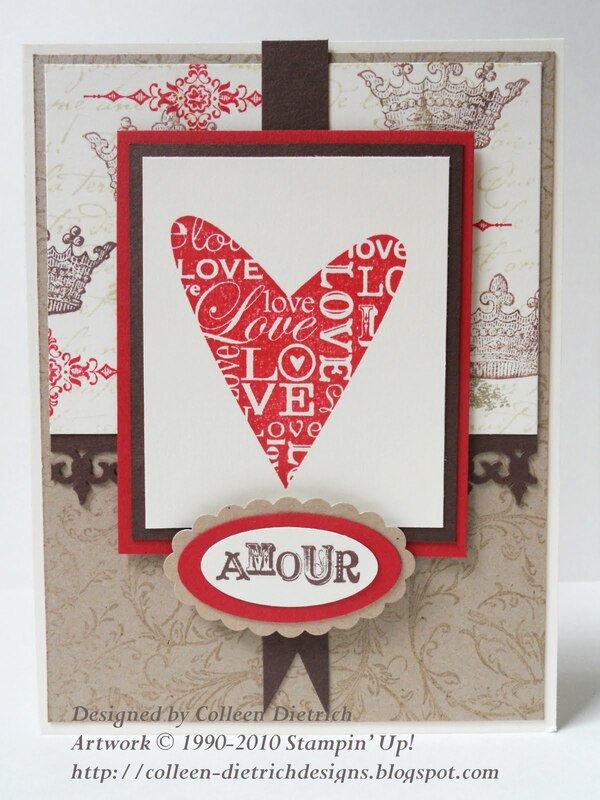 I CASE'd (copy-and-share-everything) the design of this card, and substituted some stamps for those I did not have. 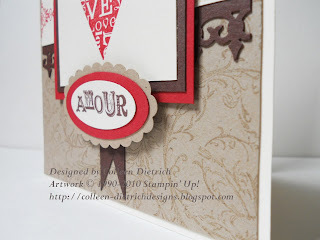 I believe I saw the original of this card on Stampin' Up! 's website, when I was still a demonstrator. I'm sorry I do not have a name to give credit to. 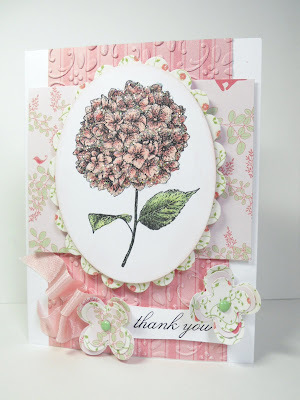 Thanks so much for bearing with me through another post today. I have one more to do before I hit the hay tonight! See the strawberries on the card? 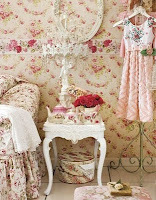 They are free images you can download from Victoria Magazine. 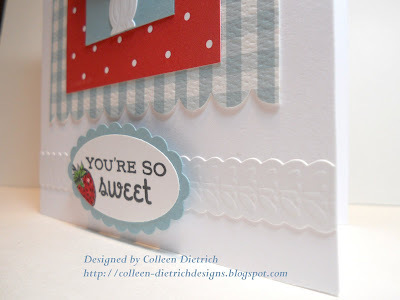 I printed mine on a piece of Whisper White cardstock and punched one out for my card. The 'sweet' sentiment/berry are from Flourishes' Strawberries set. And I entered my card in the Splitcoast challenge, Free For All #24, "It's Garden Pickin' Time." 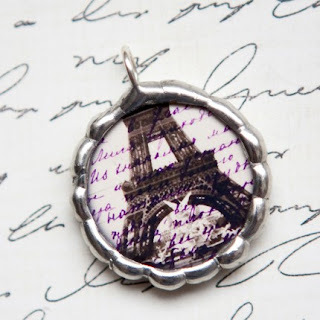 and a challenge over at Penny's Paper Crafty Blog, "Anything Goes." Here's a close up of the white embossed sticker strip along the bottom. I do hope you enjoyed my card today. 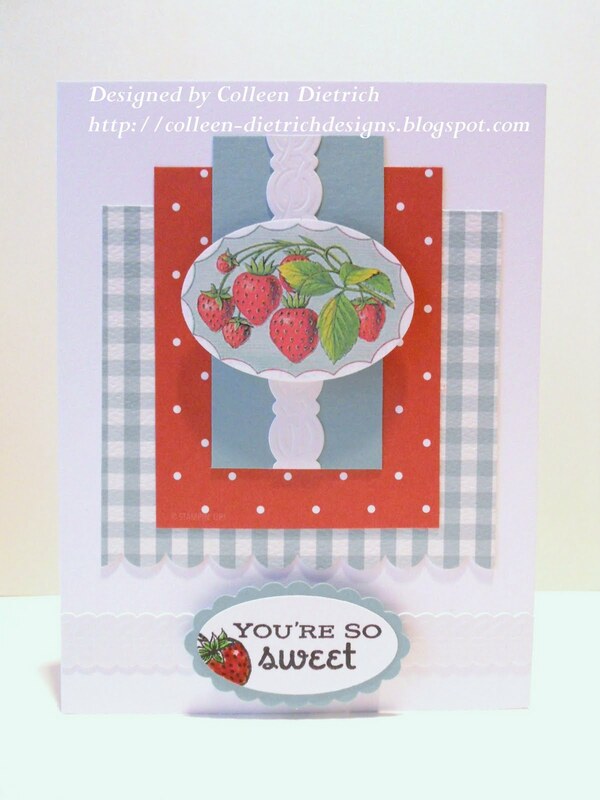 I just love strawberry cards! 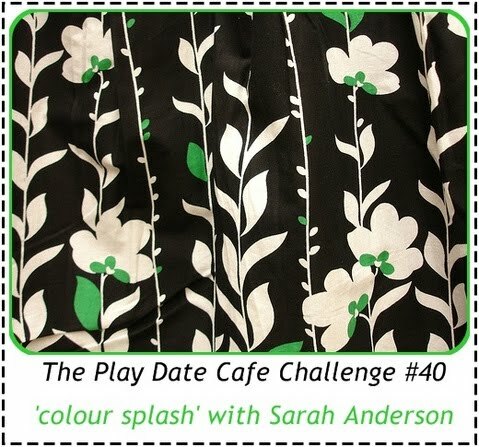 I love playing in The Play Date Cafe challenges. I just made the deadline with this card. The current challenge, #40, is to use black and white with a splash of green. I used a sketch from the magazine Paper Crafts' Go to Sketches, page 36. Close up pix of silver balls. It's past midnight. 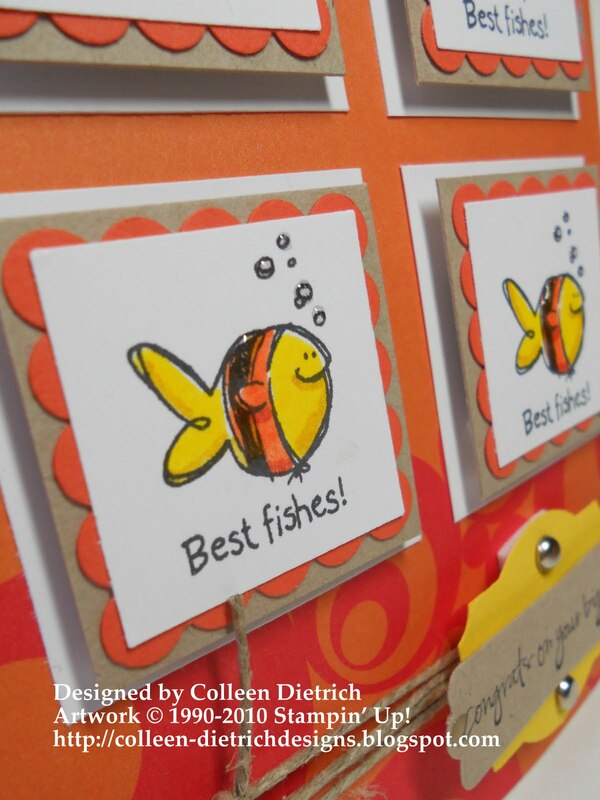 I've made cards all throughout today. I am very tired. What's that, Pillow? Here I come! Here's a new size card for me: 4.25" square. It fits into a regular A2 size envelope (which holds 4.25" x 5.5" cards), so there's no extra postage as there would be with a larger square envelope. No extra postage is a GOOD thing at Christmastime. My Stampin' Up! demonstrator, Gail Murray, had featured a card very similar to this one more than a year ago at one of her club meetings. I changed a few things, including the colors so that I could enter this in the Color Throwdown Challenge #103. This card also fits in Aud Sentiments #7 - choose your own Christmas sentiment. I used the spotlighting technique to highlight the word "Imagine" in red. 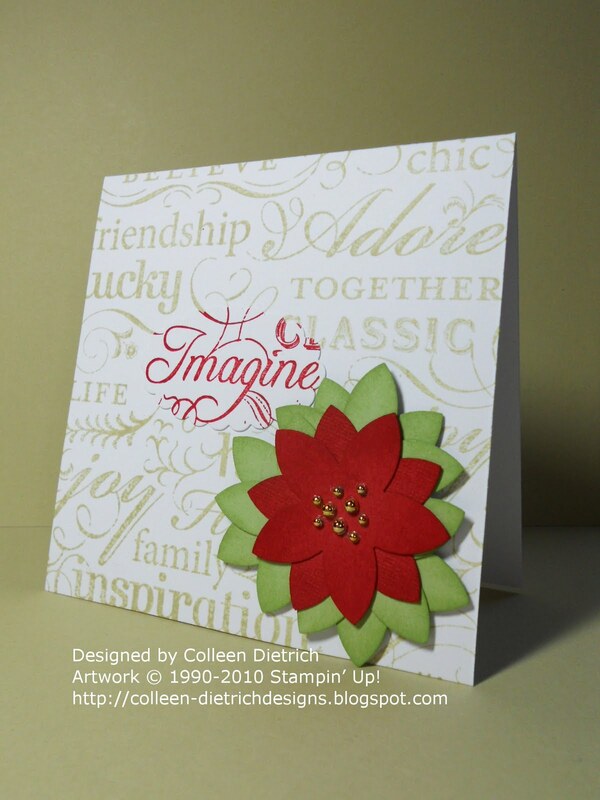 The poinsettias were made using only a 5-Petal Flower punch. I layered two red ones, one right behind the other. The leaves I made by cutting apart some of those 5 petal flowers and fitting them together to see what looked best. I'm not totally hooked on the way the leaves turned out, but they're alright I guess. The gold 'pearl' stickers stand in for the yellow flower of a pointsettia. Yes, those yellow things in the center are actually the flower. "One traditionally thinks of a Poinsettia as a red flower, however, the flower is actually yellow but very small and insignificant. The colored 'flower' that makes the display is produced by the large bracts that surround the little flower. 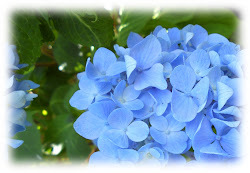 The bracts can be red, cream, pink or white." The quote is from this source on the web, WikiAnswers. So there you go. You got a card from me AND some (possibly-new-to-you) info about Christmas flowers.